Recently you’ve probably found it difficult to escape the constant headlines linking cancer to bacon and sausages. In fact, they’ve had so much recent bad press that 29% of people are now eating less meat than year ago, according to new NatCen Social research. So should you feel more uncomfortable eating pork products than David Cameron does in front of his wife? Absolutely not. Here's MH's reasons rashers and bangers deserve a prime spot in your fridge. You’re welcome. Your humble sausage contains 11g of muscle-building protein and a slice of bacon packs 10g, which is ideal for adding inches to your biceps. You need 1.6g of protein per kilo of bodyweight everyday to bulk up, according to nutritionist Scott Baptie. Which means the two rashers of bacon in your sarnie already covers 28% of your daily muscle fuel total. No, we’re not telling porkies. Scientists at Kyoto University found bacon is a great source of the hormone coenzyme Q1, which ramps up your metabolism when combined with a brisk walk. In fact, the study showed six rashers of bacon an hour before your stroll to the office will double your fat burn. Yes, processed pork is full of fat, but, luckily for you and your tastebuds, it's the good kind. In fact, half of the fat in bacon is monounsaturated, which is the sort one study published in the American Journal of Clinical Nutrition found reduces your blood pressure and risk of cardiovascular disease. So pig out on that fry-up, guilt-free. Why? Processed pork is full of selenium. Yes, it might sound like a rubbish Doctor Who monster, but it’s actually an essential micronutrient and key component of a healthy thyroid gland, as well as a strong immune system. Add 100 grams of bacon or sausages to this lentil hotpot and you’ll get your RDA in one bowlful. Sausages and bacon are high in phosphorus, which is great news if you’ve had three pints too many the night before. The reason? Topping up your phosphorus is an important way of maintain of improving kidney function. 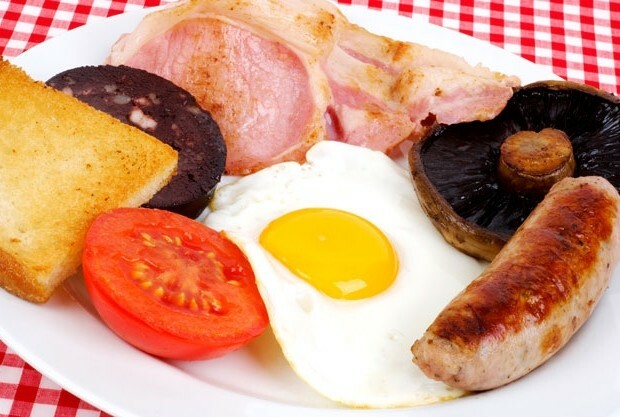 Add an extra rasher to your hangover-beating breakfast and get 20% closer to your RDA. Just because you’re eating pig doesn’t mean it’ll make you look like one. Both sausages and bacon contain over 40% of your Niacin RDA, which is vital for healthy skin, hair and eyes according to research from the University of Maryland Medical Center. Plus, the same study also showed that enough Niacin will keep away depression. Yes, it’s a scientific fact that sausages and bacon will make you happy. However, one dilemma remains– red or brown sauce?